As wonderful a tool as the camera is, it remains a recording device for a moment in time. Since its invention, many of our saints, blesseds, and venerables have been captured as they were in time. Yet pictorialism and modernism proved to be a bad mix for depicting the modern saint in eternity. 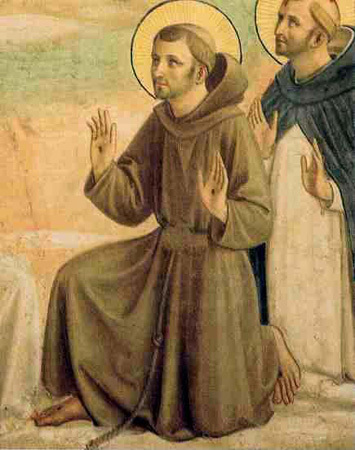 With the camera, we are confronted with realistic images of what the saint actually looked like. Modernism reinforced this actuality with iconoclastic removal of the halos, auras, aureole, mandorla, and nimbi; the exclusion of signs and symbols of divine luster; and the absence of personification of figures. This has led to a secular language dependent on realism to mark and make identity. However, we as artists and architects need to make identity visible again by means of form, space, light, and color. Just as the photo does not include likeness, neither does the literal use of light as form include image. Between the two, a new iconoclasm was introduced to Catholic art. Misinterpretations of Sacrosanctum Concilium on the use of “contemporary artists” sealed the fate of an idealistic representation of our saints. The relationship of image to likeness and likeness to image is reciprocal—a good and noticeable exchange, and a recognizable exchange. Scripture tells us that Adam recognized the atomic design in Eve’s image, and Adam said, “This now is bone of my bones, and flesh of my flesh; she shall be called woman, because she was taken out of man” (Gn 2:23). But due to original sin, our first parents lost this likeness to God. Did Adam and Eve know the will of God before the Fall? Certainly they knew of God’s will for them not to eat from the tree of knowledge of good and evil. Was their likeness to God their knowledge of the will of God? Was their fear, their nakedness, not only their loss of likeness to God but the loss of their ability to intimately know the will of God? Left without the knowledge of the will of God, without the likeness of God, we retained image and were given free will to choose the will of God and to choose His likeness. If we are made in the image and likeness of God, then as Christian artists, and in particular as those who make devotional paintings and sculptures, how do we discern image from likeness? The great early Church theologian Saint Irenaeus examined the difference between God’s image and His likeness, and later theologians developed the idea further. Our representations of the sanctified have to factor in those elements that contain both image and likeness of God—namely, those aspects that are both human and divine. We are assured that this will render something that is both like us and not like us at the same time. If likeness of God remains unimaginable and unattainable in a photo, then it is not the image but likeness that we desire. The irony here is that the more and more we emphasize the physical image and the actual appearance, the less and less we capture the spiritual likeness and holy transformation. Christ, Who is fully human and fully divine, for the most part has been historically portrayed to the best of the artists’ abilities. Yet from the earliest of Christian imagery to the late nineteenth century, depictions of Christ fully human and fully divine were shown in art by the use of something both actual and implied, by means of worldly light and shade, color and space. But most of all, before the photo, Christ was depicted as clothed in human form with physical, visible attributes transformed and re-presented to reveal invisible truths of unimaginable form. Of course, the Theotokos in her Immaculate Conception must also have retained both divine image and likeness. 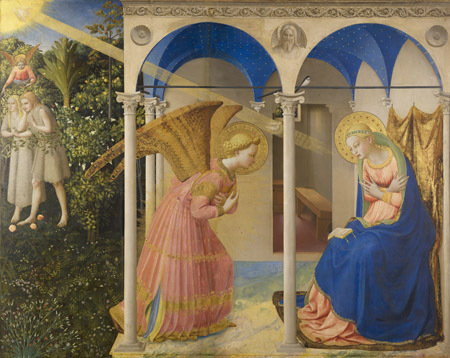 This is revealed at the Annunciation and again at the Visitation, when Saint Elizabeth, despite seeing no visible image of Christ, recognized, through Mary’s radiant holiness, that the person of Christ dwelt within her cousin. And the Baptist jumped for joy as he also recognized this hidden presence of the Second Person of the Trinity. Perhaps it is what Saint John Paul II expresses when he writes: “The body, and it alone, is capable of making visible what is invisible: the spiritual and the divine. It was created to transfer into the visible reality of the world the mystery hidden since time immemorial in God, and thus be a sign of it.”3 The plight of the “invisible” unborn is exactly this; if it is not visible, then it is not a person. It is this very fusion of image and likeness that those makers of sacred art are commissioned to accomplish. It must not be one without the other. If we do not admit the presence of a corporeal body, how do we acknowledge incarnation, birth, death, and rebirth in Christ? As Catholics, our art and architecture must acknowledge that it was through matter that we are saved, but it is not matter that has saved us. The depiction of only matter conveys no transformation and therefore no transcendence. We cannot expect the photo and photorealist forms, which are by their very nature so time-bound, to take on the cloak of immortality, transformation, and transcendence. This is partly due to the fact that the photo is a memento, a recorded moment of the past. Having no present or future, it is locked into the time and place, a static moment when the shutter was clicked. The image of God is His creation and is of matter. The likeness of God entails a transformation to more greatly reflect and participate in the divine nature. Realism, and in particular photorealism, contains matter only, but not divine likeness—for that likeness belongs fully to those born without original sin and to our saints in glory. Hence, it is due to this inability to bring image and likeness together that photos and photorealist works never transcend the moment in which they were made. They are therefore unsuitable for devotional art. Since it is confined to the moment in which it was taken, the photograph fails to communicate a sense of ongoing history or eschatology. The only witness to a photo’s particular perspective is the photographer, and its context may be limited to the individual’s memory of that time and place. The camera is an ingenious device in recording light and shade. This precise record of tonalities and light patterns is so convincing that we fail to see how equally inadequate it is in describing actual space, in particular the binocular vision of the human. Yet we accept it as “real.” It is no wonder that photos or movie stills of someone who has portrayed Christ become iconic, as in the self-portraits of Fred Holland Day in ”The Seven Last Words of Christ,” or stills from Zefferelli’s Jesus of Nazareth or Gibson’s The Passion of the Christ. Although inspirational for some, these cannot serve as devotional art. “The Seven Last Words,” photographed self-portraits by Fred Holland Day, 1898. Certainly, with the decline of usage of our Catholic signs and symbols, we become more and more reliant on the physical attributes they bore in time rather than their sacred attributes in time and eternity. Thus, the absence of sign and symbol merged with photorealism becomes a form of iconoclasm. Have we allowed the signs and symbols—those attributes of the sanctified—to all but disappear to the point whereby we can only recognize our modern saints by how much our art resembles their last photo? When our saints are represented in photographs or photorealist paintings, those depictions blur or obscure the relationship of image and likeness. Further, we are more likely to be attracted, and thus distracted, by the artifice used. But where photorealistic images fail the most is in their making us think of the sitter, the model, the person whose face and hands were used in the making. In other words, we think of the model in time and not the saint in eternity. When our saints are represented only as they appeared in life, or as in their final photos, then we are recapturing only a momentary physical appearance—their image in time—and excluding their invisible likeness to God outside of time and into eternity. Although the photo may be inspirational, it remains in essence non-devotional. For Christians, and Catholics in particular, to depict Christ in flesh is not an anthropomorphism of an idea nor is it the personification of an abstract. Not only do we use human flesh to depict the Incarnation, but the Church also uses the human body in personifications of faith, hope, charity, etc. On the other hand, if divine images become so personalized that one portrays the godhead doing everything human and mundane, then the relationship becomes overtly casual and overly confident. We see this in images of Jesus playing soccer with the kids, standing behind us as we stare at the computer monitor, or being beside the vet while examining our pet dog. It gets worse with the anti-corporeal, flat cartoon images, overly simplistic missalette covers, and pseudoicons done in a borrowed and falsely conceived Byzantine style. These all hearken to flatness without any theological basis or reason. When images are represented as flat silhouettes, they again fail us as the form becomes so alienated that we must say it is too much not like us in image, and nothing in terms of likeness. Whether trivialized through photorealism, the feigned naiveté of cartoon versions, or disproportioned silhouettes, as our Catholic art and architecture become anti-corporeal and flatter and flatter, should it be any surprise that many Catholics consider the Most Blessed Sacrament a mere “symbol”? But considering the camera, what are we now to do with our canonized saints who were photographed in their lifetimes? With Popes John Paul II and John XXIII, we now have extensive videos of two canonized saints. As contemporary artists, we may feel challenged and held accountable for those photo images bearing their “likeness” in time. But we must be mindful that these photo documents are not their likeness in eternity. Saint Thérèse of the Child Jesus and the Holy Face, Saint Pio, Blessed Teresa of Calcutta, Saint Maximilian Kolbe, Saint Edith Stein, Blessed Miguel Pro, Saint Frances Cabrini, Saint Gianna Molla, and Saint Théophane Vénard—all were photographed. However, we are still being called to represent them not solely in their image but moreover in their likeness to God. With the advent of the camera, so many of our modern saints are portrayed in devotional art as they appeared in their last photos. And so we see Padre Pio as the hunched octogenarian, and the same for Blessed Teresa of Calcutta. 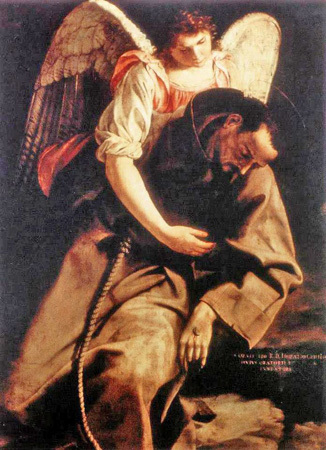 But even though we have photos of Padre Pio as a young man, can we now permit ourselves to portray him as the young saint, as the twenty-three-year-old who bore the wounds of Christ? Can we begin to accept the image and likeness of Blessed Teresa of Calcutta as the young woman of twenty-seven when she heard “the call within the call”? We see the shrines dedicated to Saint Gianna Molla, containing both paintings and sculptures, with many still based on her photo. Yet her unseen “likeness” comes from her will to follow the divine will. 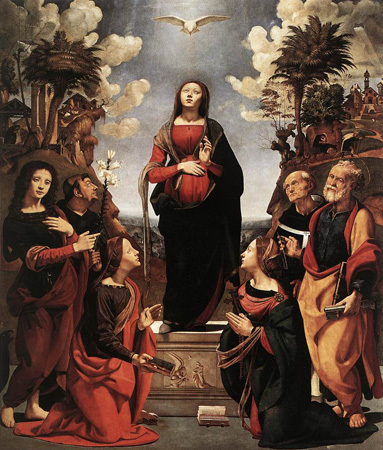 She prays, “O Jesus, I promise You to submit myself to all that You permit to happen to me, make me only know Your Will.” When based solely on the photo or the realist portrayal of the artist’s model, these images speak more of the saints’ outward appearances (their image in time) than their inward reality (their likeness to Christ in eternity). Our task then as artists and architects is to foster a careful balance of the actual and the implied, the average and the ideal, the image and the likeness. In religious works, this likeness then comes from our saints submitting their will to the will of God. Yet if we are left with only image, then we have the mere proportions of the human figure, their corporeal shell. 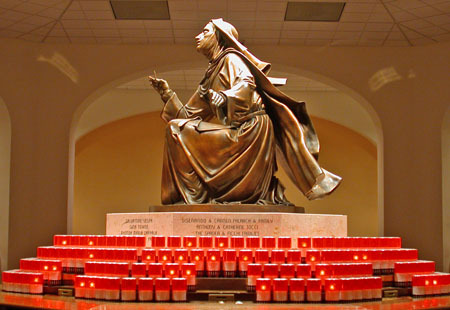 “Saint Rita in Ecstasy,” in bronze, by Anthony Visco at the National Shrine of Saint Rita of Cascia, Philadelphia. Photo: Anthony Visco. 1. http://medievalmind.blogspot.com/2010/11/all-saints-day-remembering-clare-of.html (accessed March 5, 2015). 2. Millard J. Erickson, Christian Theology (Grand Rapids: Baker Academic, 2013). 3. Pope John Paul II, “Man Enters the World as a Subject of Truth and Love,” General Audience (February 20, 1980), http://www.ewtn.com/library/papaldoc/jp2tb18.htm. 4. Pope John Paul II, “The Human Body, Subject of Works of Art,” General Audience (April 15, 1981), http://www.ewtn.com/library/papaldoc/jp2tb59.htm. 5. Pope Benedict XVI, “Address of His Holiness Benedict XVI on the Occasion of the Christmas Greetings to the Roman Curia” (December 21, 2012), http://w2.vatican.va/content/benedict-xvi/en/speeches/2012/december/documents/hf_ben-xvi_spe_20121221_auguri-curia.html. 6. St. John Damascene, St. John Damascene on Holy Images, trans. Mary H. Allies (London: Thomas Baker, 1898), 5–6.